Vietnam: A Television History; Army Map Facility (Engineer Story) 66th Engr Co.
soldiers working in the cartographic, drafting, and the compilation sections, Soldier feathers edge of photo then glues it into mosaic. VS, soldiers at work in the photo reproduction section. The man photographs map on copyboard. Soldiers lay out material prior to being photographed.VS, soldier develops and processes an offset plate. VS, printing press runs off finished maps. VS, soldier surveys field with a theodolite. VS, measuring distances on field with microwave equipment Soldier pulls supply of maps from shelf in the map depot. SP Mike Baker tells about the unit's operation. 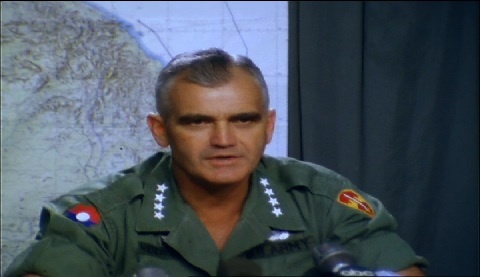 General Westmoreland seated at desk speaks in favor of the continued bombing of North Vietnam. The main reason being the saving of American lives. Men of the 13th Aviation Battalion in formation in hangar. General Harold K. Johnson and Major General George P. Seneff Jr. walk toward the hangar. General Johnson pins the Distinguished Service Cross on Chief Warrant Officer Jerome R. Daly and Warrant Officer John E. Griver. (Daly is the most- decorated-Army pilot of this war.) General Johnson talks to the men. Army Map Facility (Engineer Story) 66th Engr Co. Armies Medals, badges, decorations, etc. Chicago: “Vietnam: A Television History; Army Map Facility (Engineer Story) 66th Engr Co.,” 02/16/1967, WGBH Media Library & Archives, accessed April 25, 2019, http://openvault.wgbh.org/catalog/V_299EF004827E4A79B15DD8F24B5155F0. MLA: “Vietnam: A Television History; Army Map Facility (Engineer Story) 66th Engr Co..” 02/16/1967. WGBH Media Library & Archives. Web. April 25, 2019. <http://openvault.wgbh.org/catalog/V_299EF004827E4A79B15DD8F24B5155F0>.